Authorities in Spain are warning people to be on the lookout for anyone acting suspiciously who might be of Arabic appearance, carry a video camera, and brandish lots of cash in tourist areas. It’s part of a new counter-terrorism strategy. According to Spanish daily 20 Minutos, the police will be examining passports to check travel histories. People on the internet have started to wake up to the new reality. The pilot program is only working in the Andalusia region but the new regulations are expected to be introduced in other areas, with priority given to those with large Arab populations, like Catalonia and the Madrid area. The North African enclaves of Melilla and Ceuta are also at the top of the list. Travelers to and from Syria, Iraq, Lebanon, Turkey and Saudi Arabia will all face extensive checks, while particular attention will be given to Algerian arrivals – a known North-African terrorist threat, as far as the Spanish are concerned. Individuals carrying more than €1,000 ($1,200) in cash will be under greater suspicion as possible couriers. The dead French terrorist Amedy Coulibaly’s girlfriend Hayat Boumeddiene was believed by police to have been a money courier. The new measures don’t end there. Police will be stopping Arabs with laptops for inspection. Those driving cars will receive particular attention. Authorities will also gather CCTV footage from popular tourist areas, along with airports and other travel hubs. 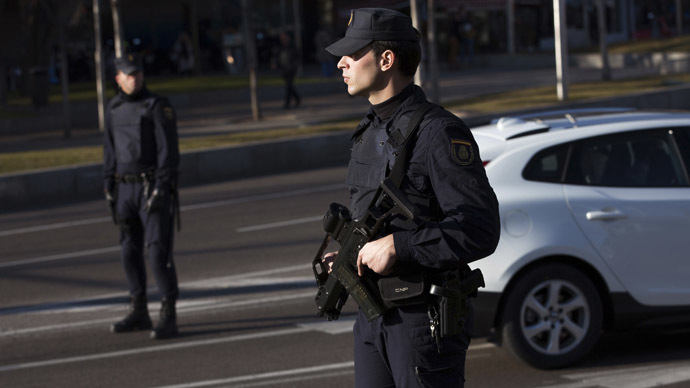 Spain has made it clear that it’s in the midst of a security overhaul following the deadly attacks in France, which claimed the lives of 17 people. While current legislation only takes care of well-established terror groups, there are fears of other, unknown elements and threats. And Europe as a whole is now on high alert. German federal investigators are currently examining the threat of possible copycat attacks by local sympathizers to last week’s attack in Paris. Denmark is to provide special assistance to a controversial mosque, which may become a target amid the various threats after the Charlie Hebdo attack. Norway is investigating a threat against two of its neighbors it believes originates from France, while Belgium will engage in online monitoring and eavesdrop on phones and popular forms of social media. Last Wednesday, two gunmen attacked the Paris headquarters of the satirical weekly Charlie Hebdo, followed by two other incidents, which ended up with 17 people dead.